On November 8, Moroccan forces attacked the Gdim Izik protest camp, outside the city of El Aayiún in the Western Sahara, and razed it to the ground. The camp had been set up around a whole series of social demands (houses, jobs, etc) and generally to demand a say in the use of the Western Sahara resources by its population. Up to 20,000 people lived in the camp when it was destroyed by Moroccan forces. We publish here a statement by the Communist League of Action, the Moroccan section of the International Marxist Tendency. The comrades take a correct internationalist position on this question, expressing solidarity with the demands of the Sahrawi protestors and defending the right of self-determination for the Sahrawi people. This position goes against the chauvinist position of the Moroccan left which for decades has capitulated to the Monarchy on this and other issues. The Gdim Izik protest camp which was not organised by the Polisario leadership and took them by surprise, was also a reflection of the tiredness of the Sahrawi people with the endless UN sponsored negotiations and talks about the future of the Western Sahara. These talks have been going on for nearly twenty years now and have led nowhere. It is also significant that the fact that the protest camp was centred on social issues created the conditions for the movement to link up with the Moroccan workers and youth who are also fighting for similar issues and break down the national chauvinism fomented by the Moroccan regime. This is really the only way forward for the Sahrawi people. The imperialist powers, mainly the US and France, support Morocco, which is a key ally amongst the Arab countries. The guerrilla war conducted by the Polisario for 15 ended in a stale-mate which led to the peace talks sponsored by the UN. After that followed 20 years of talks which have led nowhere. There is an understandable feeling of frustration and growing anger amongst the Sahrawis and some are agitating for a resumption of guerrilla war. We have the duty to warn that such a tactic would also lead nowhere. The only solution way forward for the struggle of the Sahrawi people is a mass movement combining national demands with social demands, which has a conscious orientation of linking up with the struggle of the Moroccan workers and youth. Unless the Sahrawis managed to break the national unity in Morocco along class lines, they will never achieve national liberation. The situation in Morocco is ripe for such a strategy to find an echo. In the last few years we have seen repeated uprisings and mass movements in different parts of Morocco (during the attack on Gaza, the Sidi Ifni intifada, etc). This is the only realistic perspective for the struggle of the Sahrawi people. The brutal repression of the Gdim Izik protest camp shows how afraid the Moroccan regime is of a protest of this kind, precisely because of its potential of spreading to Morocco itself. As the comrades of the Communist League of Action make clear, this does not mean that we take a pacifist point of view. On the contrary, the brutal repression of the Moroccan regime needs to be resisted, but the resistance should be based on the mass struggle. Self-defence committees should be created based on and under the control of the masses organised through democratic committees of action. Finally, we should denounce the stinking hypocrisy of the Spanish right wing Popular Party, which has come out “in favour of the Sahrawis” and against the Moroccan regime. This is the party which is the inheritor to the Franco regime in Spain and which continues its tradition of the most brutal oppression of the democratic rights of the nationalities in the Spanish State. This is the party that when in power in 2002, organised a ridiculous imperialist conflict with Morocco over the uninhabited island of Perejil (Laila), off the coast of Morocco, with the only intention of asserting its rights as a former imperial power. This is the party that has a racist attitude towards Moroccan and other immigrants in Spain, which they want to keep illegal so as to better exploit them as cheap labour and use them as scapegoats for the crisis of the capitalist system. They are no friends of the Sahrawi people and they should not be allowed to pose as such by the solidarity movement. Together with the report and the statement by the comrades of the Moroccan Communist Action League, see also the document The struggle of the Saharawis, history and perspectives, originally written in 2002, which provides a Marxist analysis of the question of the Western Sahara. 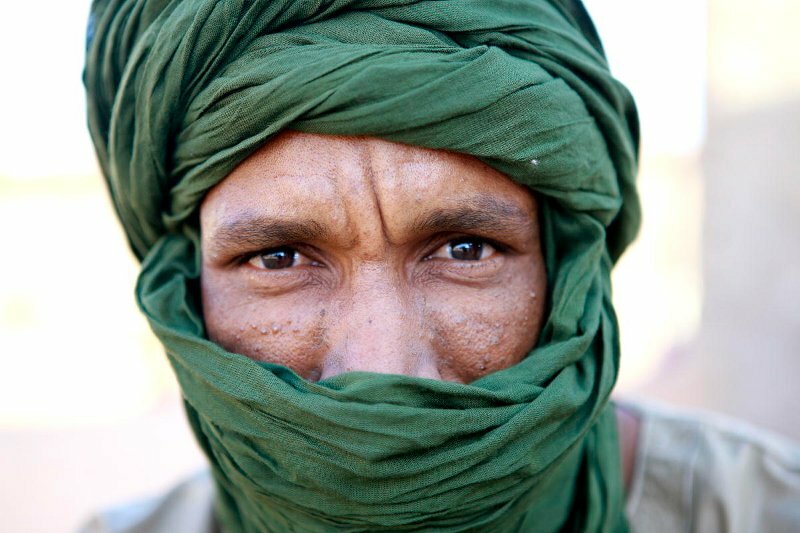 Sahrawi Refugee. Photo: UN Photo/Martine Perret The protest movement was launched on October 10, after a group of families and young Sahrawis announced the setting up of a camp in an area about 12 km outside the city of El Aayiún, called "Gdim Izik". In the beginning, the number of tents was not more than 30 and the authorities did not pay much attention to it. But soon thousands of protesters joined the camp, bringing within a few days the number of tents to thousands - more than 6000 tents - housing about 7,000 households, and nearly 20,000 protesters. Most of them were former residents of the shanty town of Al-Wahda. These men and women, who have suffered from neglect for many years, stood up to fight for their legitimate demands. They faced the ongoing repression and disregard for each protest movement by the military barracks surrounding the city and a media blackout by the official media and even the "independent" media. A left-wing activist told the Moroccan magazine Tel Quel that there had been an "accumulation of anger for months", and that "protesters had tried initially to sensitize the city officials, knocking on several doors, but to no avail. No one wanted to listen to them." One of the protesters and told the Spanish newspaper El Pais: "We will continue our struggle until we achieve our legitimate demands to live in dignity in our homeland." What is truly impressive is the high degree of organisation shown by the protesters. They formed a committee to oversee the running of the camp, made up of nine people: eight men and one woman, all under forty years of age, most of whom are unemployed. Protesters have been able to organise the camp with a commission to collect refuse, one to guard the camp, another to regulate the distribution of water, food and to keep morale, as well as a health care commission, etc. First the Moroccan regime, with the help of tribal elders, tried to achieve the dismantling of the camp by making promises - after they had realised the movement was spreading like wildfire and there were attempts to establish similar camps to the east of Smara, and the same thing by some people in Tarfaya, Boujdour, etc. They attempted to open channels of dialogue because the situation had become a severe embarrassment and questions were being raised among citizens, both in Morocco and in the rest of the Western Sahara, many of whom face similar problems. The Moroccan Interior Minister personally oversaw the talks. The Moroccan state made a series of promises to the protesters, such as the distribution of 600 lots of land to some of the widows, as well as cards for National Reconstruction, and promised to resolve all the problems of the protestors, on condition that the camp should be dismantled, and at the same launched a massive propaganda campaign around these offers in the bourgeois media. But none of this achieved the desired effect. The protesters rejected the attempt by the authorities to divide them and insisted on resolving all problems before any dismantling of the camp. Faced with this resilience the Moroccan regime mobilised thousands of troops and the Auxiliary Forces and the police and laid siege to the camp. They engaged in constant provocations against the protestors and terrorised them by constantly flying helicopters over the camp, erecting barriers surrounding the camp, and the setting up checkpoints on the outskirts of the camp. Their aim was to prevent the Sahrawi and solidarity activists from reaching the camp and cut it off from supplies. The Spanish paper El Pais reported how "this blockade led to lack of food and drinking water and the spread of diseases." After the failure of its manoeuvres, the only option left open to the Moroccan regime was brutal repression. The camp had already been in place for ten days and was growing stronger by the day. In this context Mohammed VI made a speech on November 6, 2010. His message was clear: "We will not tolerate the enemies of territorial integrity, whether from inside or outside the nation." This was the green light from the supreme authority of the country and the commander of the armed forces, to use any methods necessary to dismantle the camp. That is what happened, after the state media spread the "news" that the Sahrawi had dismantled the camp, and that only a small band remained made up of those who were working for the agenda of the "Polisario" and Algeria. At about six o'clock on the morning of November 8, thousands of forces of repression armed with weapons attacked the protesters. Some witnesses reported to the media that the intervention against the "Gdim Izik" camp was carried out by mixed squads of infantry, under cover of water cannons and with the use of heavy smoke grenades and rubber bullets. Faced with this attack, the youth of the camp defended themselves with any means at their disposal, stones and knives. The streets of El Aayiún rose up to defend the protesters, and the city witnessed civil disobedience for two days, on 7 and 8 November. Then for the first time since the beginning of the protest, the Sahrawis raised the flags of the Sahrawi Republic, and the protesters were fighting with Molotov cocktails and bottles of gas, while the repressive forces used rubber bullets and tear gas. The youth also organised barricades on all roads and burned tyres to cut off the roads to the security forces. Many banks and shops and the headquarters of the government institutions were attacked, as well as El Aayiún's regional TV channel, which was burned down and the Moroccan flag was brought down and the Sahrawi flag was hoisted. The forces of repression declared a night curfew in various parts of the city. The major points of clashes were in Smara Street - a main street in the city - in addition to other streets, Kaskikima, Ras Al Khaimah, Matar, Tan Tan and Amal, etc. These confrontations left several dead and wounded on both sides, but it is difficult to determine the toll due to conflicting news from different sources. While the Maghreb Arab new agency announced that the death toll was 12, including 10 from the security forces, the Polisario Front media confirms that the number was 11 Sahrawi citizens dead and 723 others injured in varying degrees of severity, in addition to 159 missing. The President of the El Aayiún branch of the Moroccan Association for Human Rights, Hammoudi Iekiled, underlined the difficulty in ascertaining whether there were further deaths, or "a campaign of widespread arbitrary arrests" in a number of districts in the city of El Aayiún. It was also difficult to ascertain the number of detainees. Up until now, the Moroccan Minister of Interior has released a statement saying that he would be bringing "in the first stage 77 elements to justice, transferring six of them to the military court, and 64 more are pending investigation, and he decided to release seven others." He pointed out that "13 members from among them had prior convictions." He added that he "would, in a second stage transfer 36 others to the court," bringing the number of detainees the Moroccan regime has declared to 113. This movement of protest and the crackdown that followed created a great wave of solidarity at home and abroad. On Wednesday, some workers from the Boukraa phosphate mine expressed their solidarity with the protesters, and raised in one of their meetings slogans such as, “the wealth of the Sahara for the Sahrawis”. According to some international media, on Thursday, some young people formed a committee in solidarity with the protesters in Sidi Ifni. Other Sahrawi cities also witnessed other initiatives, as in Smara, Dakhla, etc. but these attempts failed because of the intervention of the forces of repression. Also there were solidarity demonstrations in several Spanish cities. In the wake of these events the paper of the USFP (Socialist Party) has published an article entitled: "The Algerian media: absolute bias and falsification of the facts". From the headline you can guess the content. On its part, the Political Bureau of the Party of Progress and Socialism (former Communist Party) has stated that "it is necessary to respond firmly to all the actions, internal and external, which come at a suspicious time, aimed at undermining the unity and stability of the country, through the exploitation of the demands of normal social demands by the separatists causing chaos and threatening public order." The National Union of the Moroccan Press has also denounced what it calls "the acts of destruction of the El Aayiún regional channel at the hands of men armed with swords and knives. "According to a statement issued by the union, the latter strongly condemns what happened and considers it to be a criminal offence that cannot be tolerated. However, the union preferred to remain silent, of course, about the actions of the Moroccan authorities. Faced with this situation, the position of imperialism, including Spanish imperialism, has been to watch and do nothing. Last Monday, speaking from the Bolivian capital, the Spanish Foreign Minister, Trinidad Jiménez, declared that, "It is premature to take any official position on the ‘events of Laayounne’, in view of the contradictory news coming from the parties in conflict” and she emphasized the need for “restraint and a return to calm and to focus on the informal negotiations that began in New York which will bring calm to the region." Meanwhile, the Spanish Prime Minister Jose Luis Rodriguez Zapatero during the meeting of the Executive Committee of the PSOE, said that Spain needs to take a balanced position between the parties in the conflict in Western Sahara, in order to maintain excellent relations with Morocco, and be consistent with the role of United Nations mediator for the Sahara, stressing that it was impossible for Spain to abandon Morocco, which is a link between the East and West. In turn, the Secretary-General of the PSOE, during the meeting, emphasised that it was premature to take a final position on official events of El Aayiún, before knowing the full truth and the outcome of the process of dismantling of the Gdim Izik camp. The Algerian regime has found in the events an opportunity to express "solidarity" with the struggles of the Saharawi people and to "denounce" repression, etc. This is hypocritical manoeuvre as it attempts to gain some legitimacy amongst the Algerian masses who are sympathetic to the Sahrawi people and to put some pressure on the Moroccan regime. Meanwhile it continues the same dictatorial repression of the masses of the Algerian people and imposes hunger and oppression on them. The United Nations, typically, has limited itself to demand from both parties, in the words of the official spokesman of the Secretary-General, "to exercise restraint" and prudishly pointed out that "the intervention of Morocco in the protest camp" might spoil the talks between the parties. It is worth mentioning the involvement of a number of newspapers and the Spanish media who have distorted the facts and data and published false pictures about the events. First of all we cannot but express our complete solidarity with the demands of the Sahrawi protesters, the right to work, decent and adequate housing, and our principled defence of the right of the Saharawi people to self-determination, and we stress once again that in doing so we are not in collaboration with the "external enemy" or want the breakup of "our motherland" into smaller entities, or the other slanders we are accused of by our enemies. However, we do so as a defence of a fundamental right of the peoples, that is, the democratic right to self-determination, the right to choose separation or unity without force or coercion by anyone. We must be clear in this context that we are fighting for an international socialist federation, for the abolition of the borders between the peoples of the world, and at the same time we oppose forced unity: the compulsory union between master and slave, the unity which brings together the oppressed nation and the oppressor nation by force and iron and fire. The outbreak of the recent protests on the basis of demands such as housing, employment, etc., show the correctness of the position of the Marxists about the need and the possibility of unifying the struggle of the Sahrawi people and the Moroccan people and the rest of the peoples of the Maghreb region on the basis of class, far from a narrow-minded nationalist point of view, for the abolition of capitalism and independence from imperialism. It is a striking demonstration of the bankruptcy of the tactic of individual terrorism and guerrilla struggle, and nationalist separation, on the basis of which the Polisario Front has been built, and marks the beginning of a new phase. The brutal repression experienced by the camp demonstrates that it is in the interests of the Sahrawi people to contribute to the struggle of the working class of Morocco for the overthrow of the dictatorship in Morocco. The serious deterioration witnessed in the battle of the protesters, thanks to the infiltration of criminal elements engaged in acts of vandalism, and even resorting to slaughter and urinating on corpses with the defamation of the dead, etc., are all proof of the need to organise the movement on the basis of committees of struggle elected under the control of the masses. Of course, we do not equate the violence of the aggressor, the Moroccan state, and that of the victim, the Saharawi people. We do not equate the violence of the executioner and the victim, but we do reject the methods and programmes of individual terrorism which attempts to substitute itself for the revolutionary struggle of the masses. We do not do so from a pacifist perspective, but because we consider these methods as counter-productive and not valid in the struggle for socialism, because they discredit the revolutionary and liberation struggle. These methods only serve the reactionary forces on both sides.